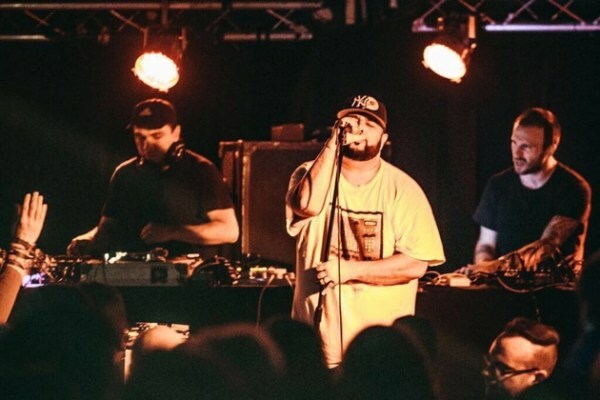 The experimental hip-hop outfit Dälek formed in New Jersey way back in the mid ’90s and they certainly brought a cosy Dublin venue to life with energetic beats to start the pre-party season. The group originally consisted of rapper MC Dälek and two DJ friends known as Oktopus and the refreshingly moniker-less Joshua Booth. As the band progressed they would go through numerous line-up changes, with the one constant being the eponymous Dälek himself, rapper Will Brooks. After around a decade of continuous and contented graft in the underground hip-hop scenes of America and Europe, the group decided to go on indefinite hiatus in 2011, as band members began to pursue different paths ranging from solo music projects to doctorates. Thankfully the group got back together in 2015 and last Friday’s gig in The Thomas House, Dublin was their second Irish performance since reforming. This time round however, their set list was bolstered with tracks from their brilliant new release Asphalt for Eden. Descending the steep concrete stairs to the dark, cramped and pokey room in which the gig took place was a suitable precursor to a gig that had the feeling of a true underground experience – both in the figurative and literal sense of the word. The gig was a sell out but due to the limited space of the room there couldn’t have been more than 50 people in attendance. The already stuffed and claustrophobic feel of the space was exacerbated when the band began to play. Their own unique style of music has been tirelessly but justifiably described as a mixture between Public Enemy and My Bloody Valentine and the unbridled noisiness of it all was certainly the most memorable feature of what was a great performance. Immediately the small room became engulfed in a pummelling wall of sound. These sounds came blaring out of the speakers, echoing off and around the interiors; subsequently turning an already intimate experience into one of pure sonic indulgence. It was slightly disconcerting after the first song to see every member of the group gesturing to the guy in the sound booth to turn up all of the stage monitors but the results of this request were immediately recognisable. By doing this they managed to create a far better balance between the music and the vocals, and succeeded in rendering the overall sound much more imposing and ultimately more enjoyable. Each song was distinct and different. They managed to successfully avoid the type of repetitiveness you might expect from a band that incorporates so much noise and distortion in their music. Instead every track seems perfectly layered and flawlessly delivered with the vocals, back beats and effects all contributing equally to an immense and captivating sound. The highlight of the gig came in the form of ‘Masked Laughter’, a lusciously droneful and somnolent homage to the struggles and conflictions of everyday life; a song that encapsulates perfectly the unique position that Dälek occupy in the landscape of modern music – that is somewhere in the hazy middle-ground between rap and psychedelic shoegaze, where they stand unmatched and almost unknown.